Love is in the air! Valentine's day just crossed on Feb 14th and Isn't it the right time to read these 13 cozy mysteries to know how deadly love can be? Sweets, Treats, and Murder by Nancy Jill Thames—The love of a woman for her godson puts her in a position to meet a young store clerk, who is murdered shortly thereafter. The Missing Jacket by Randy Rawls—A golfing buddy offers Jonathan Boykin big money to retrieve a stolen jacket, but Jonathan suspects something else is going on. “Dying for Valentine’s Tea” is the second novella in the Beach Tea Shop series. I write about a tea shop because I love the rituals associated with taking tea. When I traveled to England and Scotland, having a basket with tea, oranges, and shortbread waiting in my hotel room was just the ticket to relax and warm up after a day of sight-seeing in cool, sometimes rainy, weather. Pausing for tea is such a civilized habit. Last year Joanna Campbell Slan (a fellow anthology author) and I had afternoon tea together at the Biltmore Hotel in Miami, Florida, USA. A rolling cart brought us a selection of teas inside decorative tins. Sweets, savories, and scones on a three-tiered stand tested our willpower as they tempted our appetites. Music by a live harpist suffused the air, overlaying the sounds of guests registering or walking through the lobby. Taking an hour to unwind and talk with a good friend made a simple meal an occasion to remember. Iced tea, either sweetened or unsweetened, is a staple in the southern United States. It's simple to make. You just let hot tea cool and pour it over ice. I like drinking unsweetened iced tea with a meal, but it doesn’t replace the delightful ritual of relaxing with hot tea and tea sandwiches. I chose to write about a tea shop so that I could combine my love of cooking, specifically baking, with the pleasure I receive from having tea. The Beach Tea Shop series features three sisters: Danielle, Chelsea, and Alexandra Powell. As the oldest of three sisters in my own family, the dynamic among siblings is quite familiar to me. As for the setting, I live in Vero Beach, and my fictional town of Citrus Beach gives me the flexibility to use the areas I love and make up the parts where murder occurs. I hope you’ll visit with the Powell sisters at Beach Tea Shop. An anthology is the perfect way to sink into stories by authors you already know, and discover some that are new to you. 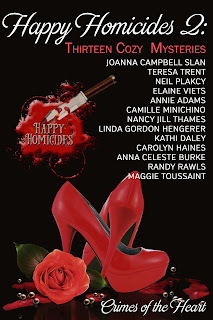 Happy Homicides 2: Thirteen Cozy Mysteries – Crimes of the Heart, is now available for only $2.99 USD. We’re also having a contest to give away a dozen roses, and a copy of the book. I could use a cup of tea right now. Thanks for having us! 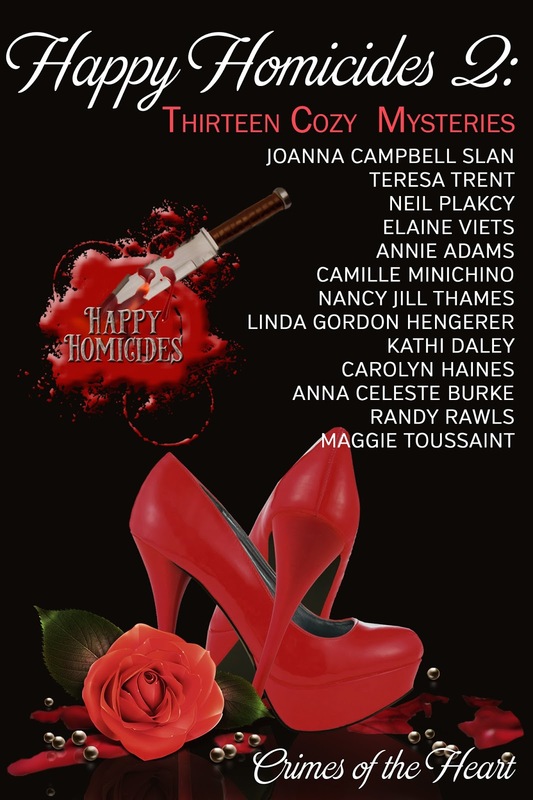 Thanks for being a part of the Happy Homicides 2 Blog Tour Mahathi! I love the idea of a quiet cup of tea, Linda! I couldn't agree more, Linda. Afternoon tea is about as civilized as you can get. Now we know there are at least two "tea loving" authors in "Happy Homides" anthologies. I'm a tea lover, too, Linda. I love Dragonwell Green tea, and even keep some in my purse in case of a tea emergency. Thank you for hosting us on our blog tour, and letting me post about the Beach Tea Shop! Your blog is a lovely stop for us. I love the rituals surrounding tea, hot and iced! I'm delighted to know more about the reason you chose to write about a tea shop.